Going to nursing school is only the first step in your nursing career.Â If you want to go beyond your basic RN or LPN roles, there are many nursing specialties to choose from. If you’re considering additional training, choosing the right nursing specialty becomes your chief focus. And there are many options to choose from. As with any higher education or specialty training, candidates will have to pass a series of exams and fulfill a period of on-the-job training. Once you decide on a specialization, you’ll need to research the individual requirements. Advanced Practice Registered Nursing – Advanced care nurse specialists with a Master of Science in Nursing, including the fields of nurse practitioners, clinical nurse specialists, nurse anesthetists, and nurse midwives. Ambulatory Care Nursing – Centered on the fast and focused assessment of critical patients; nurse, family and patient relationships, and translating nursing care into manageable activities for caregivers. Business in Nursing – You can earn a business in nursing degree, which will provide you with the understanding of the business and entrepreneurial side of health care and nursing. Bariatrics Nurse – (Super new!) Bariatric nurses are involved in the treatment of obesity.Â Hospitals, employers, bariatric surgeons, nurses andÂ especially patients benefit from having certifiedÂ bariatric nurses on staff. Camp Nursing – If you are looking for a change from a normal nursing routine, you should consider working as a nurse at a camp or a retreat. You will treat everything from insect bites to colds. Cardiac Care Nursing – Work specifically with patients who have cardiovascular conditions, such as heart attack and cardiac arrest patients. Help them to get on the road to recovery. Cardiac Cath Lab Nursing – Cardiovascular patients need to have catheterizations into the heart for treatment, and you can specialize your nursing career with these acutely ill patients. Case Management Nursing – This is a specialized type of registered nursing where you manage the long term care needs of patients who have chronic illnesses. Clinical Nurse Leader – This highly specialized nurse oversees care of a specific set of patients, such as in a specific hospital department, as well as the medical staff who work there. Clinical Nurse Specialist – An advanced practice nurse who works in a specific type of nursing, such as a certain population, illness, or type of care. Requires a Master of Science in Nursing. Community Health Nursing – This is a nurse who works specifically for the benefit of community and the overall public health. You might work specifically with people in a certain community to improve health outcomes. Complementary Health Nursing – This type of nurse uses complementary or alternative therapies to common acute and chronic illnesses. Correctional Facility Nursing – Works in jails, prisons and other correctional institutions with the incarcerated. You will see all types of illnesses in this unusual nursing profession. Critical Care Nursing – Nurses who focus their work on the most critically and acutely ill patients. Also works with unstable patients, such as in ERs. Dermatology Nursing – A specialty of nursing where you work only with people who have various ailments and disorders of the skin. You will most often work in a dermatologist’s office. Developmental Disability Nursing – Work with patients who have mental and physical disabilities. You may work in outpatient centers, rehab centers, hospitals and doctors’ offices. Diabetes Nursing – This type of nurse works with ill patients with diabetes. Much of your work centers on relaying information between patients, doctors and families. Domestic Violence Nursing – A special type of nurse who specifically works with patients who are victims of domestic violence. Heal both their physical and psychological wounds with compassionate care. Emergency Nursing – In this nursing specialty, you will work mostly in high pressure situations with critically ill and unstable patients in emergency rooms and other critical care facilities. Ethics in Nursing – This is a branch of ethics that shares many things in common with various aspects of medical ethics, where ethical issues of patient care are debated and resolved. Family Nurse Practitioner – A registered nurse who works under the supervision of a physician. This type of NP works specifically in family practice. Some NPs in some states can practice independently. Flight/Transport Nursing – Provide essential emergency medical services to patients who are in remote locations and are not accessible by roads. Forensic Nursing – These nurses work with victims of violence and those who commit it. You will work closely with the legal system in collecting forensic evidence in these cases. Gastroenterology Nursing – This nursing specialty works in the diagnosis and treatment of conditions that affect the entire digestive system. Genetics Nursing – You will treat many types of genetically inherited diseases, including cancer, heart disease and diabetes. Teach families how they can minimize their risks. Geriatric Nursing – A type of nurse who works with the elderly, who often have a variety of serious acute and chronic illnesses. Gerontological Nurse Practitioner – A type of nurse practitioner who works under the supervision of a doctor, on elderly patients with acute and chronic illnesses. Gynecology/Obstetric Nursing – A specialty of nursing that works only with female patients and reproductive health. You also will care for pregnant women and keep them in good health for delivery. Health Policy Nursing – You will analyze public and health policy so you can help to shape new nursing policy that helps patients of all ages. Hematology Nursing – This is a nursing speciality that is related to oncology nursing, where you help cancer patients with treatments, pain management and blood transfusions. HIV/AIDS Nursing – Dedicate your career to working with patients who have HIV and AIDS. Help them to stay healthy, manage their treatments and manage pain. Holistic Nursing – Holistic nursing focuses on treatment of the entire patient – both their mental and physical well being to optimize health. Home Health Care Nursing – Provide essential nursing care to people in their homes who are seriously ill with acute and chronic conditions. Hospice/Palliative Nursing – You will provide compassionate, comprehensive and total nursing care to people who in the final stages of illness. Help to manage pain and end life with dignity. Independent Nurse Contractor – You are a Â non salaried employee such as a Â ‘temp’ nurse, or Â ‘per-diem’ consultant, etc. Â You are hired on an ‘as-needed’ basis, and therefore do not Â receive health benefits, or paid vacation. Infection Control Nursing – Theses nurses help prevent patient infections in hospitals and clinics. Infection control nurses are usually the ones responsible for notifying the closest branch of the Centers for Disease Control. Informatics Nursing – Your job would be to translate nursing practice information between nurses and systems engineers, analysts, or designers using object-oriented models or other techniques. Infusion Nursing – Infusion Nurses give patients medication and fluids via injection. They monitor patients, manage their tubing, maintain arterial catheters, and stay aware of potential complications. International Nursing – Some nurses choose to go abroad and traveling the world taking care of patients in other countries, or aiding underserved nations where experienced professional nurses are not available. Labor &amp; Delivery Nursing – You would care for women during labor and childbirth, monitoring the baby and the mother, coaching mothers and assisting doctors. Lactation Consultation – This is a health professional who provides breastfeeding support and education. They can be found in hospitals, physician or midwife practices, and in public health programs. Legal Nurse Consultant – A registered nurse who uses expertise as a health care provider and has specialized training to consult on medical-related legal cases. Licensed Practical Nursing (LPN) – You have completed a program in nursing and are licensed to provide basic care under the supervision of a physician or registered nurse. Long-Term Care Nursing – These nurses Â care for patients who have a disability or illness and are in need of extended care. Their patients often live in long-term care facilities, rehabilitation centers, or nursing homes. Managed Care Nursing – As a Managed Care Nurse, you will often work with elderly and poor individuals who rely on programs like Medicare or Medicaid. Medical-Surgical Nursing – These nurses assist patients who are schedule for surgery, or who’ve recently come out of surgery (but not during surgery). Military and Uniformed Service Nursing – You would care for patients within the Military. Â Your assignments could take you all over the globe. Missionary Nursing – You would provide physical and spiritual care to people in other countries that need health care. These nurses treat illnesses and diseases while sharing religion. Nephrology Nursing – Nephrology Nurses help patients with kidney disease or abnormal kidney function. They work in one of the most diverse collections of environments in nursing. Neuroscience Nursing – You assist patients in with brain and nervous system disorders. Some duties include monitoring neurological exams. 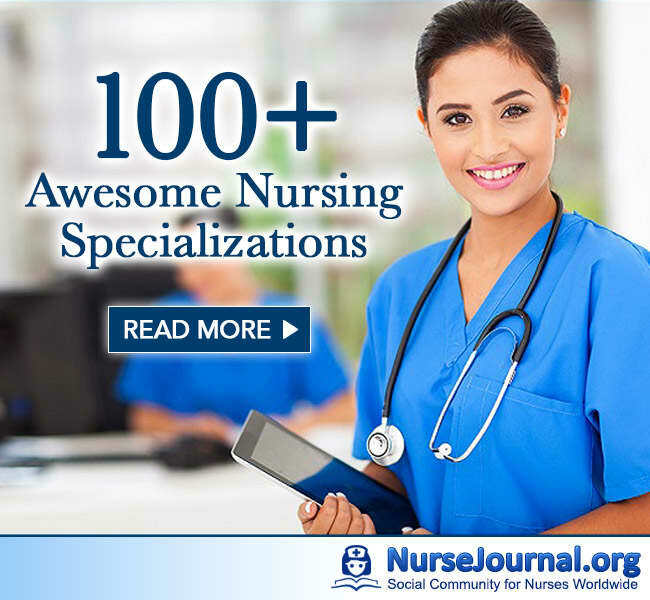 Nurse Anesthetist – This is a is a nurse who specializes in the administration of anesthesia. Â These nurses have to be Board Certified in Anesthesia. Nurse Attorney – Nurse Attorneys have earned both their nursing and law degrees, so they can represent medical professionals in court, or work to change health care policies. Nurse Educator – This is a nurse who teaches and prepares licensed practical nurses and registered nurses for entry into practice positions. Nurse Legislator – Nurse legislators work on making changes to existing laws or passing new legislation based on nursing industry needs. Nurse Life Care Planning – These nurses help patients who have suffered catastrophic injuries and illnesses, advocate for them, and plan out their care. Nurse Midwife – These are advanced practice registered nurses who provide counseling and care during pre-conception, pregnancy, childbirth and the postpartum period. Nurse Practitioner – Nurse practitioners manage acute and chronic medical conditions through comprehensive history taking, physical exam, and the ordering of diagnostic tests and treatments. Nurse Researcher – These scientists design studies, analyze data, and report their results for use in improvement of the field of nursing. Nursing Advocacy – They help patients understand their diagnosis and make the best decisions about their health. They act as liaison between doctors and patients. Nursing Entrepreneur – They Â use their nursing education and business background to start ventures within the healthcare industry. Nursing Executive and Nursing CEO – In this job, you have the opportunity to shape health care policies at your organization or facility, and help your nursing staff provide the best patient care possible. Nursing Manager and Nursing Administration – These nurses are mainly responsible for recruitment and retention of the nursing staff and their management. Nursing Quality Improvement – The nurses in this field focus on improving the quality of hospitals, long-term care facilities, and other medical care facilities. Nursing Writer, Author, or Historian – These nurses write textbooks, articles, and books about important figures in nursing. They can also consult and write scripts for television shows and movies about nurses. Occupational Health Nurse – Using their specialized experience and education, these registered nurses recognize and prevent health effects from hazardous exposures and treat workers’ injuries/illnesses. Oncology Nursing (Cancer Nursing) – They provides care for cancer patients. These nurses also monitor physical conditions, prescribe medication, and administer chemotherapy and other treatments. Operating Room Nursing (Perioperative Nursing) – OR nurses are the ones who are actually in the operating room during surgery, doing different tasks to either directly or indirectly assist in performing the actual operation. Ophthalmic Nursing – Nurses in this concentration care for people with eye disorders. They are essential during operations, assisting the surgical team and functioning as circulating or scrub nurses. Orthopedic Nursing – this kind of nurse takes care of people with musculoskeletal diseases and disorders like arthritis, fractures, broken bones, joint replacements, genetic malformations and osteoporosis. Overseas, Development, Volunteer, Missionary or Refugee Nursing – These nurses provide physical and spiritual care to people in other countries. Â Their work often includes raising awareness and money for medical supplies, clean water, schools and medical facilities. Pain Management Nursing – Pain Management Nurses assess the source of pain, and work with other nurses and doctors to coordinate treatment. Parish Nursing – This is a practice specialty that focuses on the intentional care of the spirit, and prevention and minimization of illness within the context of a community of faith. Pediatric Endocrinology Nursing – This is a medical subspecialty dealing with physical growth development in childhood, diabetes and other endocrine disorders. Pediatric Nurse Practitioner – They work with patients from infancy to young adulthood, diagnosing illness, conducting exams, and prescribing medication. Pediatric Nurse – These nurses specialize in pediatrics and devote their knowledge and skills to caring for children from infancy through the late teen years. Perianesthesia Nursing (Recovery Room Nursing) – This is a nursing specialty practice area concerned with providing nursing care to patients undergoing or recovering from anesthesia. Perinatal Nursing – They teach mothers-to-be about prenatal health, and what they’ll experience while carrying a baby. Plastic Surgery Nursing – They help patients undergoing plastic surgery or recovering from procedures. They work directly with surgeons in the operating room where procedures take place. Poison Information Specialist – They treat patients who have ingested poison, and work with schools and businesses on poison prevention and treatment. They are highly specialized Toxicology Nurses. Psychiatric Nurse Practitioner – They do many of the same things a psychiatrist does, including diagnosing mental illness and prescribing medication. Psychiatric Nursing – They treat patients who suffer Â from a Â variety of mental health conditions such as Bipolar disorder and Depression. Public Health Nurse– Â They Â work Â with whole communities. Â Public health nurses Â Â Â Â Â Â Â Â Â are able to educate people about health issues, improve community health and safety, and increase access to care. Pulmonary Care Nursing (Respiratory Nursing) – These nurses work with patients with breathing problems. These lung-related issues can include asthma, tuberculosis emphysema, cystic fibrosis, and lung cancer. Rehabilitation Nursing – You would work with patients with long-term physical disabilities, or chronic illnesses, ultimately helping the patient achieve as independent a lifestyle as possible. Rheumatology Nursing – You would help people with rheumatic diseases like lupus, fibromyalgia, and rheumatoid arthritis. Duties would include monitoring blood work, and managing medication. School Nursing – This job would be to help students who get sick during school hours. Â You would administer basic medical aid. Sub-Acute Nursing – This nursing specialty would require treating patients in need of 24 hour supervision in hospitals or long term care facilities. Substance Abuse Nursing – This is a specialty where nurses are trained in pain management of people in substance abuse treatment centers. Â They may also counsel patients. Supplemental/Agency Nursing – This is a freelance position where you work at hospitals or long term care facilities when their staffing is low. Surgical Nursing – You would work in a surgical environment such as an OR, providing care to surgical patients before, during, and after surgery. Telemetry Nursing – They monitor patient’s vital signs with an electrocardiogram or other life sign-measuring device, and generally provide care to patients with heart failure, and other acute diagnoses. Telephone Triage Nursing – These nurses are trained to ask patients specific questions in order to asses the situation, and refer them to the proper healthcare provider rather than a clinic or emergency room. Toxicology Nursing – You would care for and treat people that have swallowed poisons, have been bitten by snakes or stung by bees. Transcultural Nursing – Based in anthropology and nursing, It is a specific cognitive specialty in nursing that focuses on global cultures and comparative cultural caring. Transplant Nursing – They help patients who donate or receive organs. Â The also care for patients after transplantation, and monitor post operative care for complications. Trauma Nursing – Trauma nurses generally work in Emergency Rooms, or other chaotic environment and provide care for urgent situations. Travel Nursing – These are nurses who travel to fill nursing positions wherever there are shortages. Â They mainly work in hospitals. Triage Nursing – These nurses âsortâ patients into groups based on their need for medical attention. Â They can work in ER’s, on battlefields and in situations of Â disaster. Urologic Nursing – They treat Â patients with urinary health conditions and perform urinary health exams and diagnose problems like bladder incontinence. Vocational/Licensed Practical Nurse – These nurses provide routine patient care under the direction of a Registered Nurse or Physician. Wound &amp; Ostomy Nursing – These nurses cares for patients with wounds caused by medical treatments, diseases, or injuries. They also provide post-surgery treatment and care for patients with ostomies. Phew! If you know of an interesting specialty I overlooked please comment below I’m sure there may be a few others.